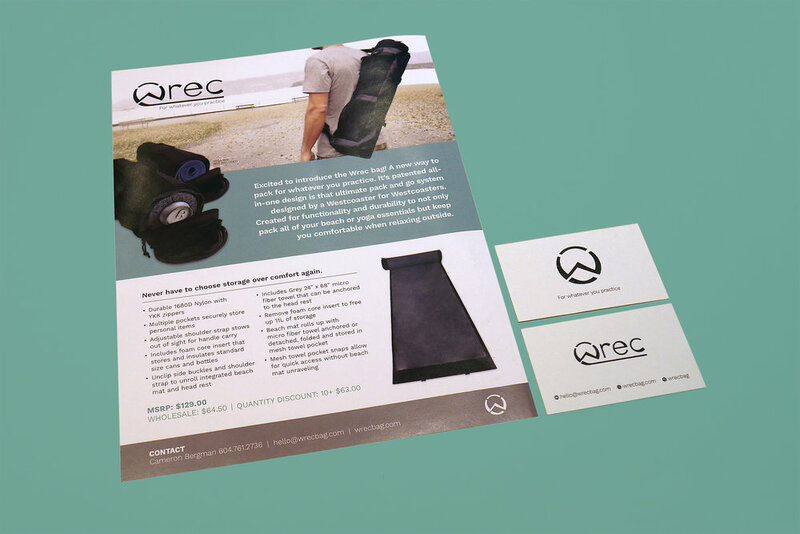 Wrec Bag was an innovative start up looking for a visual identity that stood out in the yoga, recreational bag market. We worked with their founder to capture their central ideals: enjoying yoga and the picturesque Westcoast lifestyle. Through the design development process we focused on combining the iconic imagery of the Westcoast mountains and ocean together with the unique roll-out functionality of the Wrec Bag. It was essential to convey the importance of maintaining a balanced active lifestyle especially in today's modern hectic world. The logo and the accompanying visual identity captures enjoying and relaxing in the Westcoast lifestyle. Audiences connect with the modern aesthetic and subtle ode to the coastal mountains and ocean. Since launch there has been tremendous interest in the Wrec Bag. Several yoga studios and boutiques are now stocking the innovative bag. The colour palette was created to convey the spirit of life on the West Coast; fresh air, lush forests and refreshing waters that are enjoyed while using the Wrec Bag. Paired with the Work Sans typeface to create a clean and modern aesthetic. Short Stop Motion videos showcasing features and storage options of the Wrec Bag. This was a great opportunity to convey the personality of the brand. Injecting a fun and light-hearted aesthetic that aligns with the products purpose... Relaxing and enjoying the outdoorsy Westcoast lifestyle.